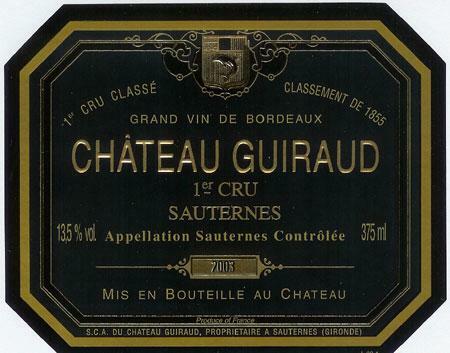 Château Guiraud is a sweet white wine ranked as Premier Cru Classé (French, "First Growth") in the original Bordeaux Wine Official Classification of 1855. Belonging to the Sauternes appellation in Gironde, in the region of Graves, the winery is located in the commune of Sauternes. The estate vine plantings consist of 65% Semillon and 35% Sauvignon Blanc. The vines are on average 35–40 years old. The property is certified biodynamic, something very unusual and unique in an area like Sauternes. Wine Spectator 91"This has a nice broad feel to its coconut, fig and creamed pear notes. The long finish sports mouthcoating tropical papaya and guava flavors, with a toasted hazelnut hint waiting to break out. Quite rich, but still forward and approachable now. Drink now through 2020." Wine Spectator 97 TOP 100 2008 "Delivers lots of botrytis spice, with lemon tart and cooked apple. Full-bodied, with loads of cream and vanilla and an intense tropical fruit and honey aftertaste. Long and viscous, with a layered and beautiful spicy finish. Hard not to drink it now. Best after 2014.